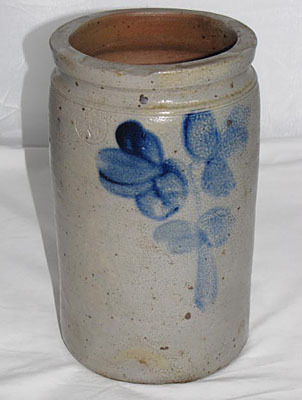 One gallon stoneware jar with marked stamp 1 gallon P. Herrman, Baltimore, Maryland. Front and reverse side with blue flower decoration, jar does have a small chip and some repairs. Measures 10 ¼" high and 6" diameter.